INDIANAPOLIS – Raghu G. Mirmira, MD, PhD, has been named director of Riley Hospital’s donor-supported research facility, the Herman B Wells Center for Pediatric Research. Dr. Mirmira is an international leader in Type 1 diabetes research—specifically the biology of islet cells, which include the beta cells that produce insulin in the pancreases of healthy people, but are attacked by one’s own immune system in people who develop Type 1 diabetes. Amongst his many achievements, Dr. Mirmira’s research studies have led to the discovery and characterization of fast-acting insulin analogues, which are widely used by patients with diabetes today. He first came to IU in 2008, after Eli Lilly and Co. made a philanthropic gift to Riley Children’s Foundation in 2006 to establish the Eli Lilly and Co. Pediatric Diabetes Research Laboratories at Riley Hospital. As director of the Wells Center, Dr. Mirmira will lead efforts to increase research collaboration amongst scientists and physicians to accelerate the development of new approaches to the diagnosis and treatment of childhood diseases, as well as providing an outstanding training environment for students, residents and fellows. Seven groups within the center focus on research related to asthma and allergic diseases, basic diabetes research, cardiovascular genetics, developmental cardiology, hematologic malignancies and stem cells, infectious diseases and global health, and molecular oncology and experimental therapeutics. The new position will be an addition to Dr. Mirmira’s current roles as Eli Lilly and Co. Professor of Pediatric Diseases, director of the Center for Diabetes and Metabolic Diseases, professor of pediatrics and medicine, and adjunct professor of physiology and biochemistry at IU School of Medicine. Dr. Mirmira said he is looking forward to leading such an important and exciting area of research for IU School of Medicine. 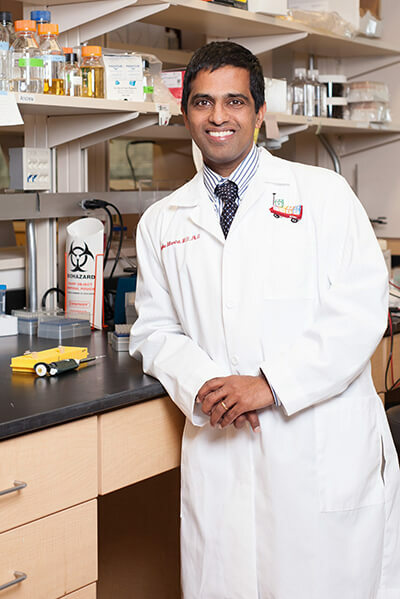 Anantha Shekhar, MD, PhD, IU associate vice president of research for university clinical affairs and IU School of Medicine executive associate dean for research affairs, said Dr. Mirmira’s expertise and track record at IU make him a great fit for the position. Dr. Mirmira succeeds former Wells Center director Mervin C. Yoder, MD, who held the position for the past nine years. Under Dr. Yoder’s leadership, the Wells Center has gained continuous support for pediatric research from Riley Children’s Foundation, achieved new levels of funding from the National Institutes of Health (NIH) and has grown in new faculty recruits. According to the NIH’s Blue Ridge Institute for Medical Research, the IU School of Medicine Department of Pediatrics is now ranked within the top 10 pediatrics departments nationally in NIH research. Dr. Yoder will continue his duties as associate dean for entrepreneurial research at IU School of Medicine. “We thank Merv for his many years of service and look forward to Raghu continuing and expanding opportunities for innovation in child health in his new position,” said D. Wade Clapp, MD, chair of the Department of Pediatrics at IU School of Medicine and Physician-in-Chief at Riley Hospital for Children at IU Health.